OMG. I can’t believe I have neglected my blog for so long! I blame work entirely. But thankfully I had a week off in Mallorca (Majorca?) for a Pilates and Hiking Retreat. The teacher was excellent at Pilates, but useless at leading group hikes. I still enjoyed myself and managed, with the ever supportive M, to eat some decent vegan food. 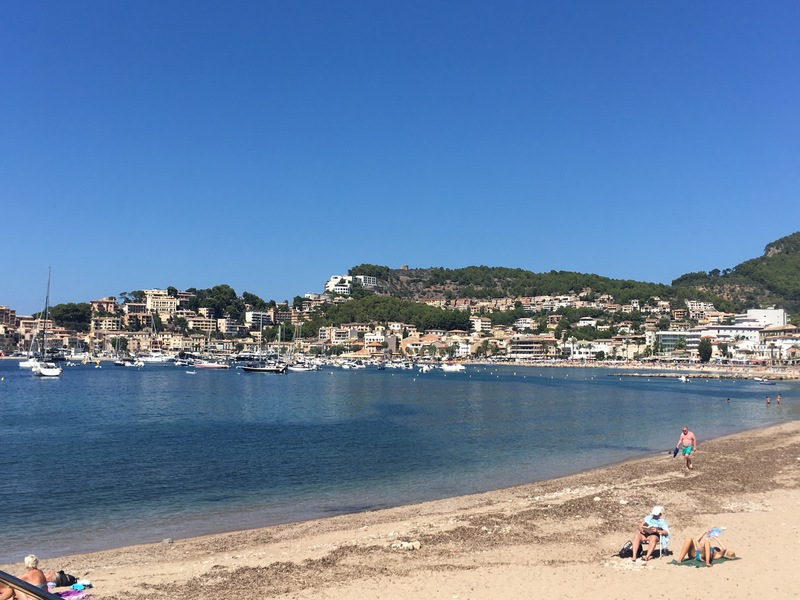 I stayed in Port de Soller, in the north west. Beautiful, quaint and I would highly recommend a visit there. The flight was only a couple of hours long from Gatwick. But before the flight, a lounge to chill in. There are numerous to choose from in Gatwick North, I was told by a lady in another lounge which one to head to – and it wasn’t the one she was in! I went to the No 1 lounge. A nice space, free flowing drinks, but no decent vegan options when it came to food. I ordered a flatbread, sans feta and yoghurt dip – so basically salad on doughy bread. I just had the salad, and compensated with a few glasses of prosecco. Hotel Es Port, a pretty town minutes away from the seaside in Port De Soller. A very picturesque hotel I must say. The gardens, reception, common seating areas were stunning and rustic. In comparison, the rooms were pretty simple – especially in the ‘newer’ part of the hotel. I was clearly not in blog mode so didn’t take pics of the room. There was also a lovely spa, free to use for hotel guests – pool, jacuzzi, steam room, sauna and therapists too – if you could get an appointment. I did have a 1/2 hour back massage, and it was excellent. Bed: comfortable, did the trick when we weren’t chuckling looking at dodgy photos or awake due to indigestion. HAHAHA. Shower: nice and clean, good power shower (which was lovely after the hike and being out in the heat) and beautiful Ritual toiletries. I was pleasantly surprised with the quality of food I encountered. It definitely did get better as the week went on, and Happy Cow did come in handy when looking for a few restaurants around the port. Breakfasts were included as part of the hotel stay – and as you would expect, a pretty extensive spread, perfect for omnis – lots of eggy and meaty options. There were a few things I could eat, but after a few days it became a bit monotonous. Orange juice that you press yourself and fresh warm bread were the highlights. When beans were on the menu, they were on my plate, sitting on top of that glorious bread – brown, rye, it was all good. The fruit salad was yummy too, and they had soy milk! So not all bad, but what also helped with the variety were those fabulous chia puddings. I don’t travel without these any more, they are so handy and super tasty, both the vanilla and chocolate flavours are excellent. Breakfasts were big and they kept me going through the day when I was hiking. When I wasn’t, well, they still kept me going 😝. As for lunches, a few of them were mainly on the go while hiking . As expected, I had a decent snack pack I brought with me – nak’d bars (lemon drizzle – my new favourite) and Clearspring nuts and seeds (all of them are FAB) mainly. I did find a little place on Happy Cow – Petit Cafe Frozen Yoghurt. What did I find there? Not the frozen yogurt (they didn’t have any vegan ones!) or the coffee (they did have soy/almond milk but it was too hot to have any) BUT the vegan croissants!! Flaky, crumbly, tasty – they made me very happy. 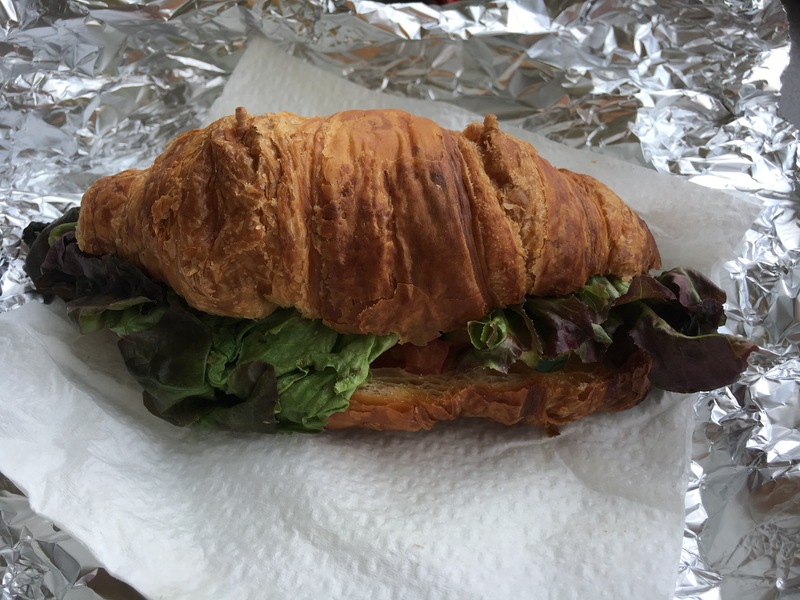 They also had croissant sandwiches which were excellent for lunch. We stumbled across this restaurant after our hike on the first day – I think it was part of a hotel but I can’t remember now. The menu was luscious sounding if your a seafood lover, but I did see gazpacho – perfect to have in the sun – and patatas on the menu. Expecting bravas I got fritas – and limp ones at that. They came with a ‘spicy sauce’ – mayo I think, which I left to one side. The gazpacho was flavourful but a bit watery. A meal for the stomach if not the senses. Now this was one delicious meal. Once again, thank you Happy Cow for this suggestion. Interestingly enough it only had one rating (mine is the 2nd :). But what sold me is it was the only place I had come across that had a vegan section on the menu. A cute little restaurant with a small indoor space and a massive outdoor seating area, I loved it. It was a hot day so I went for a Hugo – lovely and refreshing. Choosing a main on the other hand? It was either the gazpacho or the aubergine salad. The latter was recommended and oh my word. Was I glad it was. I usually have this dish warm – but cold, with all the garnishes and this sensational miso dressing – heavenly. And not only that, there was dessert!!!!! Strawberry soup, yuzu sorbet, bits of crumble, coconut milk cubes, edible flowers. Beautiful and super tasty. A wonderful wonder dessert and a lovely end to a really great meal. This place was utterly great – I SO recommend it. Dinners were more interesting – had some really fab food. First night dinner was in the hotel – top hit on trip advisor and a classy little outdoor joint. What I loved about this place is that when they found out I am vegan they made an effort throughout the meal to make sure I was happy. And I was. The amuse bouche was this pumpkin concoction, whetting the appetite. The bread basket had bread made with eggs/milk, so they went out of their way to bake me a baguette so I didn’t miss out. Warm, fresh bread with grassy earthy local olive oil. LUSH. My main? Quinoa with vegetables. Boring I hear you say. Boring is what I said when I saw it – but it was jam packed with veggies and flavour – I enjoyed every mouthful. I’d go back. Trying to find a place for dinner on the port was quite difficult. Restaurant after restaurant, all targeting tourists. We went to one that was full of people, we even had to wait 1/2 hour for a table. A proper Spanish restaurant, we ordered vegetarian paella. But before that – bread, olives and pardon peppers as we were starving. The peppers were yummy (can’t really go wrong). The paella was ok – yummy to start off with but it did get quite oily towards the end. I wouldn’t go back to this one. Having tried out NONAME at lunch, I wanted to try it again for dinner. Not that there was a different menu, i just wanted to try more of the options available. We sat outside this time, just as lovely as inside. We started off with some lovely glasses of good quality of cava, and a few nibbles. Guacamole with cassava and plantain chips, and hummus with crisps. But not any hummus, curry flavoured hummus. Moreish, tasty and very different. Most enjoyable. For mains, I decided to try the tagine with veggies and cous cous, and M went for another veganisable option, wok fried veggies (but she had some chicken if I remember). Mine? Looked very tomatoey but was super delicious – the chef in the kitchen definitely knows what he’s doing. I had a bite of M’s veggies – nice variety but waaay to sweet. Would definitely go back… a really wonderful restaurant. This has got to be the best restaurant I went to. It wasn’t in the Port, but rather in the town centre, Soller, a tram ride or a 10 minute cab ride from the hotel. We discovered it by accident. We were looking for an early dinner, but in Spain, that is unheard of. So we walked into a hotel hoping to eat in their restaurant – which was closed! But the lovely people at reception recommended a few other decent places to eat – including this one. We walked past just before 7, and grabbed the last table available. A really really pretty space, lovely lovely service and very knowledgeable about what I could eat – a lot it turns out. The first time I went (yes, we went again on our last night too), I just chose 2 dishes, the padron peppers with a romanesco sauce, and utterly delicious vegetable tempura. Yes yes, not your typical tapas, but super amazing. Crispy as hell, with this stunningly good sesame seed dipping sauce. SO GOOD. I could NOT not order the vegetable tempura again, and it was just as good. I also ordered the vegetable escabeche, crunchy, pickled, flavourful vegetables and the gazpacho – presented very prettily in a giant wine glass. I couldn’t fault any of the dishes.. The bread was also delicious and went down well. The omni dishes – tuna, prawns, ham and the spaghetti with truffles – were also very good. No complaints there either. We went the whole way and indulged in desserts. The omni option looked fab – chocolate and ice cream and biscuity, cakey, meringue things – went down well, M polished it off even though she should have stopped after 2 bites when she was truly full. Mine? Simple, clever and I am so stealing this idea to use at home – lemon sorbet with rose cava. Not much to look at but it tasted sooo good. Try it – such a brilliant idea. An espresso completed this excellent meal. Other memorable things that went in my mouth? Orangey treats – all local! 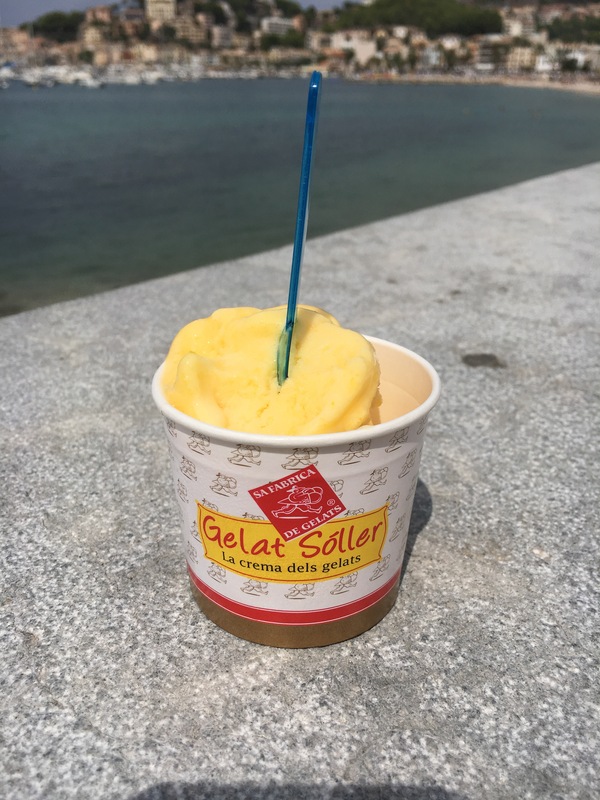 I had an orange sorbet – good, but I would have loved it more if it was more bitter and less sweet. And more fresh orange juice. More so because of the situation as opposed to the juice. 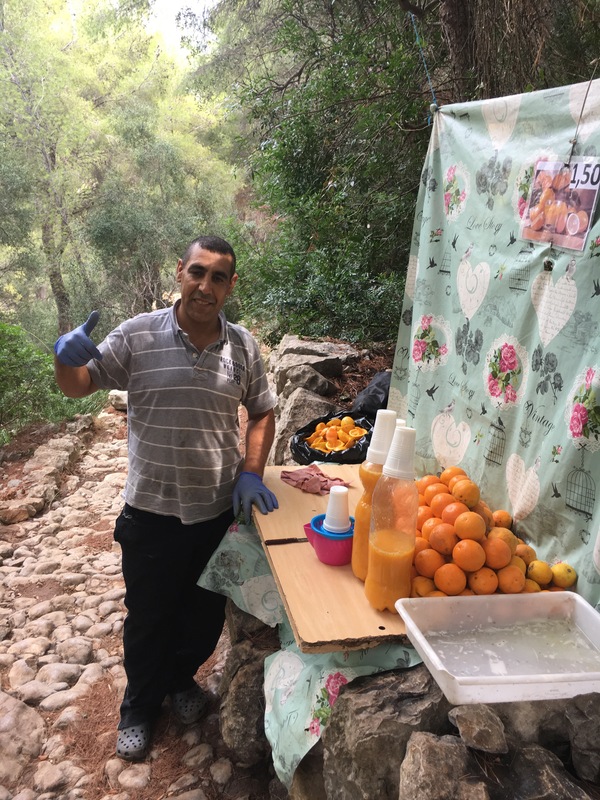 I went for a solo hike one day and I was almost at the end, my water almost finished, hot, sweaty and I spot this man on the way down – selling freshly squeezed orange juice for eur 1.50. Cool, refreshing, hydrating – talk about being at the right place at the right time! All in all, I enjoyed some pretty good food on this trip, especially as it is getting easier and easier to find vegan food. Whoo! Pilates, hiking, chilling by the pool, swimming and reading. We also went up to a sunset spot and saw a glorious sunset. Perfect! 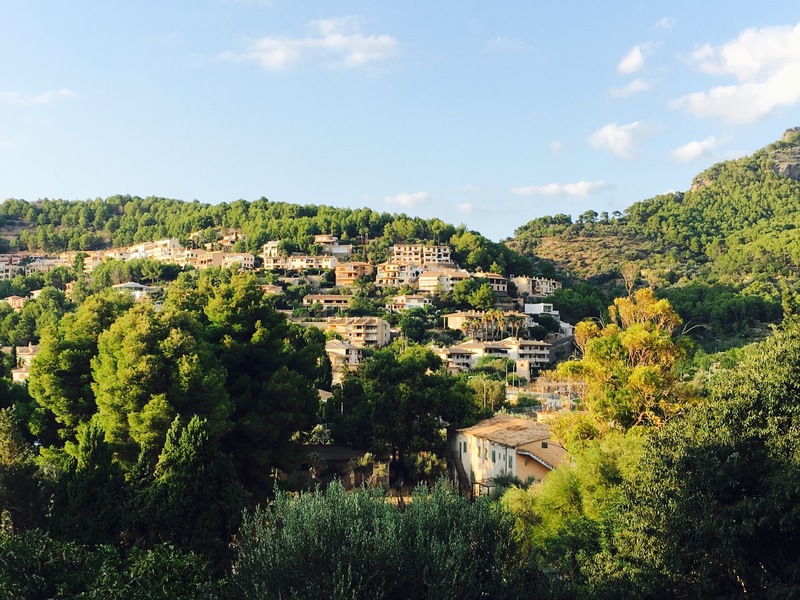 The hikes were really scenic, the views were stunning, regardless of where I was walking – to Soller, Fortnalux, the refugi maleta lighthouse – truly wonderful. All the routes are very well marked, so if you are out with a guide who has no regard for health and safety for the group or goes at her own pace and not the group’s (sheesh. Passive aggressiveness in all it’s glory! ), you can go out on your own and not get lost.